Notes: NB This is postmarked on 28th May1967 and is therefore a souvenir cover not a first day cover. The above Royal Mail Sir Francis Chichester stamps were issued on 24 July 1967 by Royal Mail and feature the following stamp designs: 1s 9d Gipsy Moth IV. 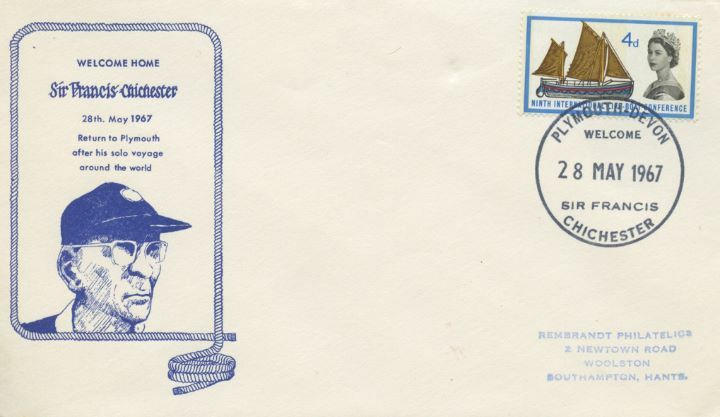 The Welcome Home Sir Francis Chichester first day cover with the Plymouth, Welcome Sir Francis Chichester, Special Handstamp postmark has been produced by Official Sponsors and features these stamps which can make a very collectible and lovely gift.